Quick! Name the state flower of Hawaii! If you responded, "ma'o hau hele," without skipping a beat, maika'i -- good for you! 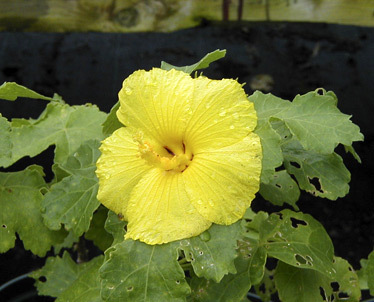 If you responded with "yellow hibiscus," or just "hibiscus," you would be only partly right. It is a rare and endangered hibiscus that is our state flower. This plant is a native Hawaiian endemic species, found nowhere but in Hawaii. Only three remaining populations are known on Oahu, all in the Waianae Mountain Range -- about 42 plants in Kealia, 30 in Makua Valley and 700 in the Waialua area, according to Kim Welch of the Oahu Army Natural Resource Program. Few people have seen this hibiscus in its various wild habitats (as a rambling shrub in one area, a 20-foot tree in another, each suited to the habitat). Some who have observed the plants over time in the wild have noted that the flowers seem to open between 2 and 4 p.m. Sadly, last month's wildfires, which burned 7,000 acres along the Waianae Range, destroyed more than two-thirds of Oahu's largest population of the state flower, confirmed Matt Keir of the Oahu Army Natural Resource Program Center near Schofield Barracks. It could have been worse, had it not been for the work of the center's personnel before, during and after the fire. Hawaii's state flower, the yellow hibiscus -- ma'o hau hele in Hawaiian -- is found in only three wild populations on Oahu, all in the Waianae Mountain Range. Over the years, the center has been monitoring the three known populations and taking cuttings from mature plants. The cuttings were labeled, bagged and taken back to the center's state-approved nursery's grow-out beds. You might have seen TV news footage of center staff members standing on bluffs, directing the private helicopters they hired to carry water to ma'o hau hele sites, as well those of other threatened and endangered plant species. Staff members were able to assist the firefighting efforts by serving as lookouts with firsthand knowledge of the terrain. Since the fire, staff members have been working closely with the state's Natural Area Reserve personnel and private landowners to develop a plan to reintroduce the young, healthy plants grown from the cuttings collected earlier in the wild. You can see the state flower at many botanical gardens, state facilities and nature centers, such as Waimea Valley Audubon Center, Lyon Arboretum, Honolulu Botanical Gardens and Bishop Museum grounds. Note: In some older books or online encyclopedias, our state flower is listed as simply "the hibiscus" or by the general Hawaiian name of pua aloalo. In 1923 the Territorial Legislature designated the pua aloalo as the "flower emblem of Hawaii," without specifying a species. The 65 years of fuzziness was finally taken care of when the state Legislature designated the native yellow hibiscus (Hibiscus brackenridgei A. Gray). Kauai residents are asked to keep their seaward-facing lights dimmed as much as possible two more months, for the protection of the Newell's shearwater birds that nest in scattered burrows high in the mountains. According to H. Douglas Pratt, ornithologist, illustrator, eco-tour leader and author of several bird books, the shearwater chicks fledge in the fall and leave their burrows at night. "They follow an innate drive to fly toward the brightest part of the sky (which used to be the distant horizon or the moon -- in either case toward the sea -- away from the island)," Pratt explains in his 1966 book, "A Pocket Guide to Hawaii's Birds." "Nowadays, however, the bright lights of towns and resorts confuse many birds, especially on cloudy nights -- and the birds rain down on lawns and parking lots. Many are killed each year by cars, cats and dogs." The problem is compounded by the fact that the birds are built for swimming and flying, not walking. "Shearwater feet are laced for swimming, and the birds cannot walk on or take off from level ground," Pratt adds. "They are not injured, but need a helping hand. If you find a grounded shearwater, take it to the nearest fire station, where it will be kept for safe release." Shirley Gerum teaches botany, ethnobotany and environmental science at Chaminade University. Her column runs on the last Mondays of the month. E-mail her at features@starbulletin.com. Shirley Gerum teaches botany, ethnobotany and environmental science at Chaminade University. Her column runs on the last Monday of the month. E-mail her at features@starbulletin.com.